Texas bass lakes have changed immensely over the last 30 or so years. So have the fish that are finning around out there, the anglers who chase them, and the biological practices that are used to manage one fishery to the next. Back in 1979, when I was a carefree high school senior with bushy hair and bad habits, the state record bass in Texas was a 13.50-pounder caught in 1943 from Lake Medina in Central Texas. A 10-pounder grabbed headlines in those days and a seven-pounder was much more likely to wind up under a knife — or at the local taxidermy shop — than it was to get released back into the lake. It was a time when keeping a limit of fat bass to eat was still cool among the masses…. when pro angler Hank Parker popularized flipping by using a long rod to win the Bassmaster Classic on Lake Texoma…. when slot limits didn’t exist…. and when the first Florida bass smuggled into Texas years earlier by the late Bob Kemp were on the verge of changing the scope of Texas bass fishing forever. Kemp, the Texas Parks and Wildlife Department director of inland fisheries at the time, was a man of vision who saw big things coming from the fast-growing Florida-strain fish released in Texas waters. And he was right, as evidenced by a surge of big bass catches that have since spread so far and wide that the list of public waters with lake records upwards of 13-pounds or better now bears the names of more than 60 different impoundments. To get a solid feel for the impact that the Florida bass have made on Texas bass fishing, one needn’t look any farther than the state’s Top 50 list of largemouths. It’s an impressive list that has been revamped so many times since I graduated high school that H.R. McGee’s long-standing Medina state record doesn’t even make the grade anymore. Amazingly, neither does the 14.09-pound state record Jimmy Kimball caught from Lake Monticello in Feb. 1980, or the 14.3-pound former state record that John Alexander caught from a private lake called Lake Echo in Jan. 1981. In fact, the only pre-1986 fish that still holds a spot among the Top 50 is the 15.5-pounder that Alexander hauled out of Echo less than a month after he topped Kimball’s mark. That fish, also a former state record, currently ties as the No. 45 heaviest bass of all-time. Interestingly, it also is the only current Top 50 fish other than Earl Crawford’s 16.9-pound state record caught in 1986 from Lake Pinkston to be reported prior to the inception of the ShareLunker program. For those who may not be familiar with ShareLunker, it is a highly publicized hatchery program run by TPWD’s inland fisheries division. The program solicits anglers who catch 13-pound plus bass to donate their fish to the state for spawning and genetics research. Begun in Nov. 1986, ShareLunker has since accepted more than 550 bass (as of press time) from dozens of public and private impoundments. Having covered the outdoors for a number newspapers and magazines (including this one) since 1986, I have had the privilege of watching the current Texas Top 50 list unfold before me. I’ve photographed a number of the fish at arm’s reach during ShareLunker pick-ups and interviewed dozens of the anglers who caught them. Back in Feb. 1986, I even had the opportunity to cradle the lifeless Crawford bass in my own hands before he sent it to the taxidermist for a skin mount. It’s been a cool ride, to say the least. Here’s a synopsis behind a handful of the giants on the Texas Top 50 list, which ranges from 18.18 pounds on the top end to 15.38 pounds in the cellar, if you want to call it that. Mark Stevenson with Ethel in 1986. Most Popular Texas Bass —Mark Stevenson, 17.67 pounds: Even though the fat bass nicknamed “Ethel” no longer ranks as the state record, most Texas big bass historians will agree that this is arguably the most famous fish in Texas freshwater fishing history. Caught at Lake Fork in Nov. 1986, the fish supplanted the Crawford bass as the Texas record. To this date it ranks as the biggest bass ever caught by a bass angler who was actually targeting bass with an artificial lure. Ethel was the inaugural ShareLunker entry and immediately drew national attention for the program and Texas fishing as she lived out her life in a huge aquarium at Bass Pro Shops in Springfield, Mo. Ethel was so popular with visitors that Bass Pro owner Johnny Morris felt compelled to give her a memorial service when she died there at the ripe old age of 19-years. Word is more than 1,000 people showed up for the funeral. Morris’ appreciation for the big bass extended well beyond the 1994 memorial service. In 2004, he provided a $650,000 challenge grant to aid in the construction of the $2 million classroom/conservation center at the Texas Freshwater Fisheries Center in Athens. He dedicated the contribution in Ethel’s name. Biggest Texas Bass—Barry St. Clair, 18.18 pounds: Barry St. Clair of Athens etched his name in bass fishing history when he reeled in the current state record largemouth from Lake Fork. Not only is his the first (and only) Texas bass to crack 18 pounds, it is the heaviest ever reported to be caught by a crappie fisherman. Fishing with a live shiner in about 40-feet of brushy water near the dam, St. Clair caught the fish in Jan. 1992. Biggest Texas Kid Bass: Jesse Roberson of Goldthwaite was only nine-years-old when the reeled in a man-size bass from a 40-acre private lake near his home in Mills County. At 15.54-pounds, the Roberson bass ranks as the No. 42 heaviest Texas bass of all-time and is the heaviest bass ever documented by a youth angler. 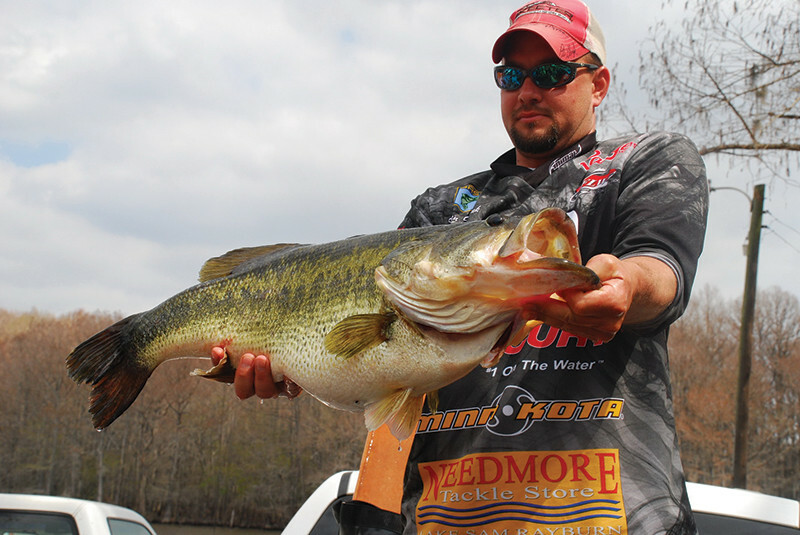 Biggest Texas Bank Bass: Lake Fork has produced five fish in the 17-pound-range. The smallest of those hulks, a 17.08-pounder, was caught in Feb. 1991 by Troy Coates of Emory. Amazingly, Coates was casting a Texas-rigged crawworm from the shoreline when he caught the No. 6 heaviest Texas bass of all-time. Biggest Bass by Woman: Big bass hate a live waterdog. Perhaps nobody knows that better than Flo O’Brain of Ft. Worth. In 1999, O’Brain used one of the lively little amphibians to fool a 16.63-pounder that ranks as the No. 12 Texas bass of all-time and the biggest ever caught by a woman. 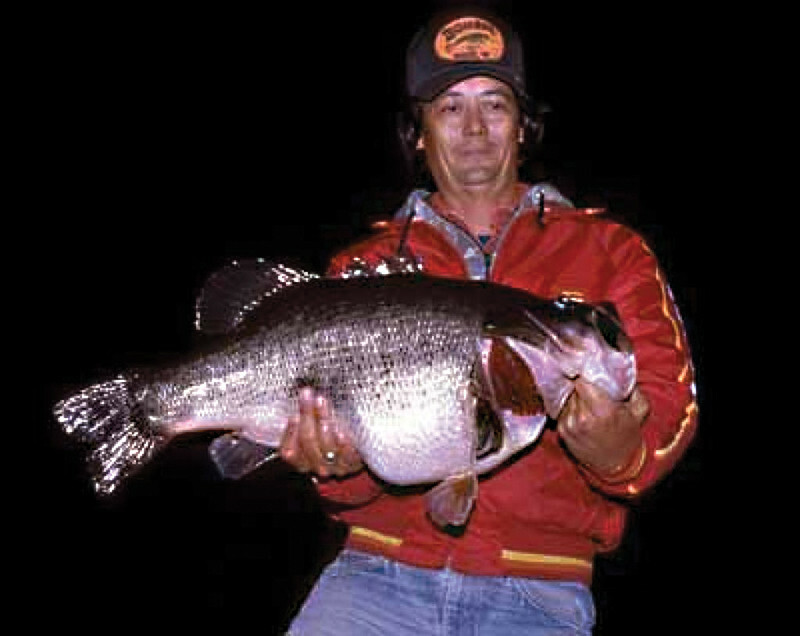 Biggest Summer/Night Bass: Jerry New of Marshall was fishing after dark in Aug. 1990 when he got one of those mysterious bumps in the night that turned out to the fourth heaviest bass ever reported in Texas. At 17.63-pounds, the New bass is certainly the biggest ever caught while working the graveyard shift. Biggest Texas Bass Caught and Re-caught: Passive integrated transponders (PIT Tags) placed in the body cavity of each ShareLunker have helped scientists identify several fish as re-captures over the years, but only one of those big bass has earned two different spots on the Top 50 list. The fish originally weighed 16.17 pounds when Keith Burns of Jefferson caught it from Caddo Lake in March 2010, making it the No. 16 bass of all-time. 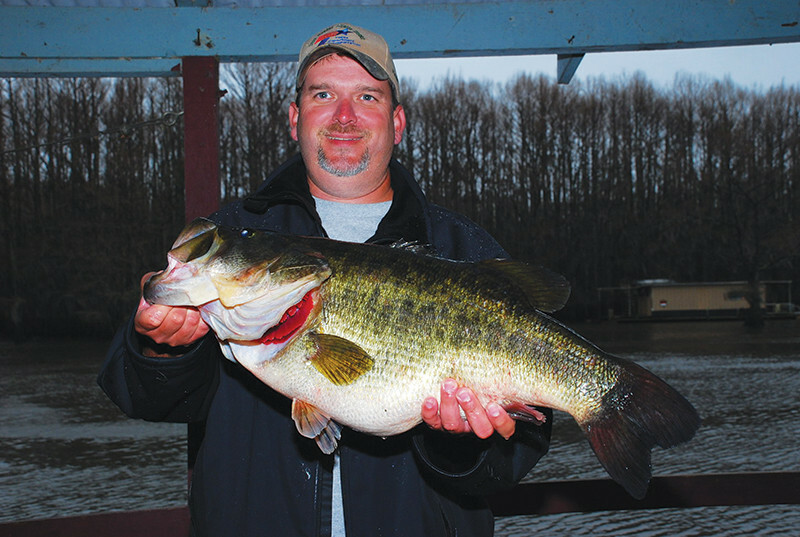 Remarkably, Sean Swank of De Berry caught the same bass in March 2011, when it weighed 16.07-pounds and nailed down the No. 20 spot on the list. Also, it marks the first time in the history of ShareLunker that the same fish has won two different anglers the ShareLunker Angler of the Year title. Sean Swank, same fish, March 2011, Sharelunker 522. Keith Burns, Sharelunker 487 in March 2010.